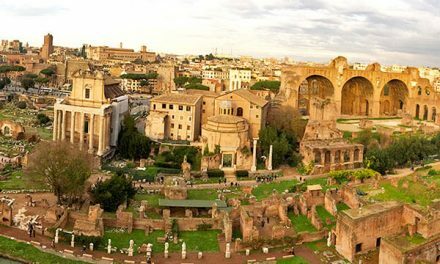 The Basilica of Maxentius and Constantine in the Roman Forum was one of the biggest buildings in the Imperial Rome. Today, it’s mostly a shell of which only the northern aisle remains. However, when visiting its ruins in the Rome Forum one can still perceive its grandeur and splendor. 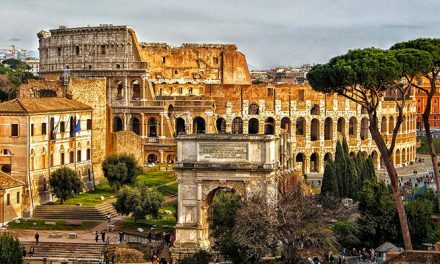 The Basilica of Maxentius and Constantine is also the last and greatest of the civic Basilicas in the monumental center of Rome. This was a public, civic space and served as a law court. 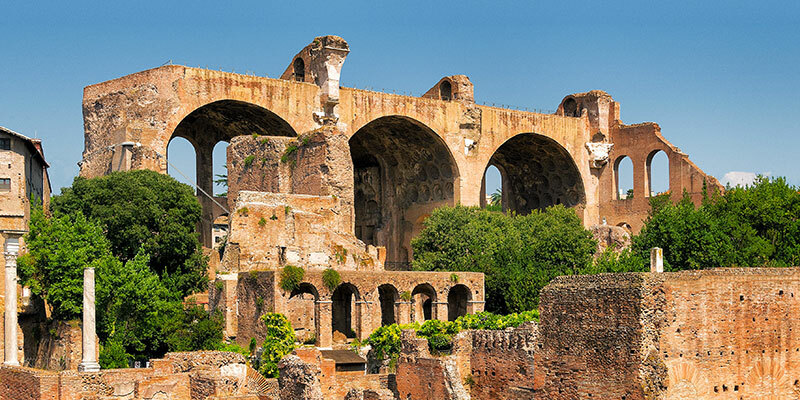 The history of the Basilica of Maxentius is linked to the life of one of the most unfortunate Roman Emperor, Maxentius, who started the construction of this imposing building between the end of the 3rd and the beginning of the 4th century A.D., when the Empire was coming undone. Maxentius managed to pull things together during at least six years of his reign, but the Roman Empire was on the edge of an unstoppable civil war. The Tetrarchy system of government with four rulers was falling apart and major discrepancies were rising about who was going to become Emperor. 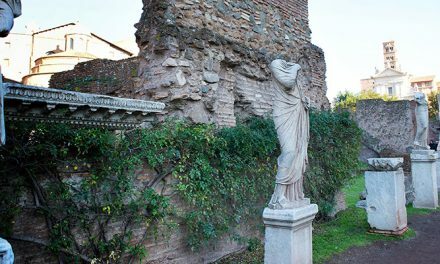 Once in Rome, Maxentius wanted to show its power and started major constructions across the Roman Forum. The Basilica of Maxentius was built on the northern side of the Velian hill. Warehouse on this part of the hill burned down, giving Maxentius the opportunity to build the biggest Basilica in the Empire. The battle of Milvian Bridge marked in some ways the end of the Empire and was decisive in turning the Empire to Christianity, shaping the religious and cultural destiny of Europe and beyond. 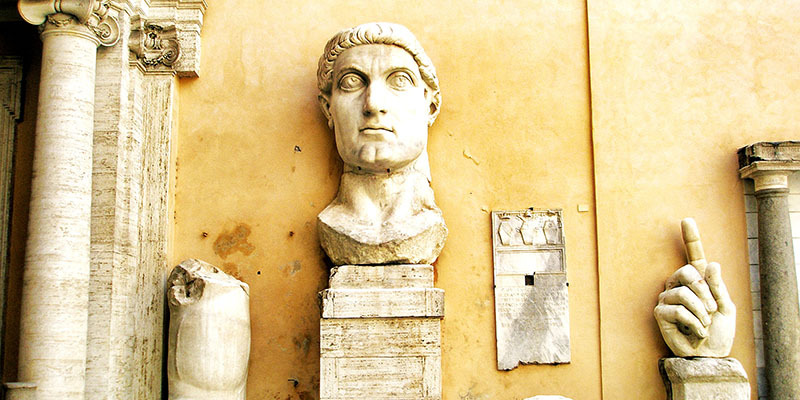 As you may know, Constantine supported Christianity and actually made it legal. However, he wanted to keep a strong link with the Roman society and still wanted to be associated with the Forum. Therefore, he completed the works on the Basilica to make sure everyone knew that he, indeed, was the ruler. This is why it is also known as the Basilica of Constantine, but the overall project was actually Maxentius work. Majestic, impressive, magnificent. 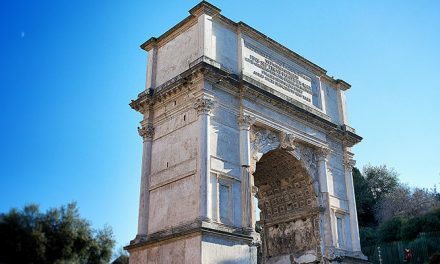 These are the words most used to describe this masterpiece of design, a sort of landmark in the history of the Roman architecture. Several findings suggest that the basilica occupied an area as big as a soccer field. Just think that the main niche in the central aisle hosted a colossal sculpture of Constantine, which was nearly 40 feet in height. Today, remains of the colossus are housed inside Palazzo dei Conservatori in the Capitoline Museums in Rome. The Basilica of Maxentius had two points of access. The main one was a monumental entrance along the Via Sacra. A staircase led to a grandiose portico adorned with two red porphyry columns and marble capitals. The main aisle, which was supported by impressive columns, was about 100 feet high. The central apsis was occupied by the colossal statue of Constantine. Two lateral aisles featured niches adorned with statues and big windows for the illumination. The floors were decorated with precious polychrome marbles. Due to the presence of valuable materials, the Basilica became one of the most plundered caves in the Middle Ages and the Renaissance. Just consider that Pope Paul V had one of the imposing columns moved to Piazza di Santa Maria Maggiore. We can still see it today at the center of the square. The Basilica of Maxentius and Constantine set an unprecedented example in terms of scale and space in the history of architecture. Thanks to the use of concrete the Romans were able to shape the space and to create the sense of grandeur. The structure was intended to WOW the audience and to show the power of the Emperor. 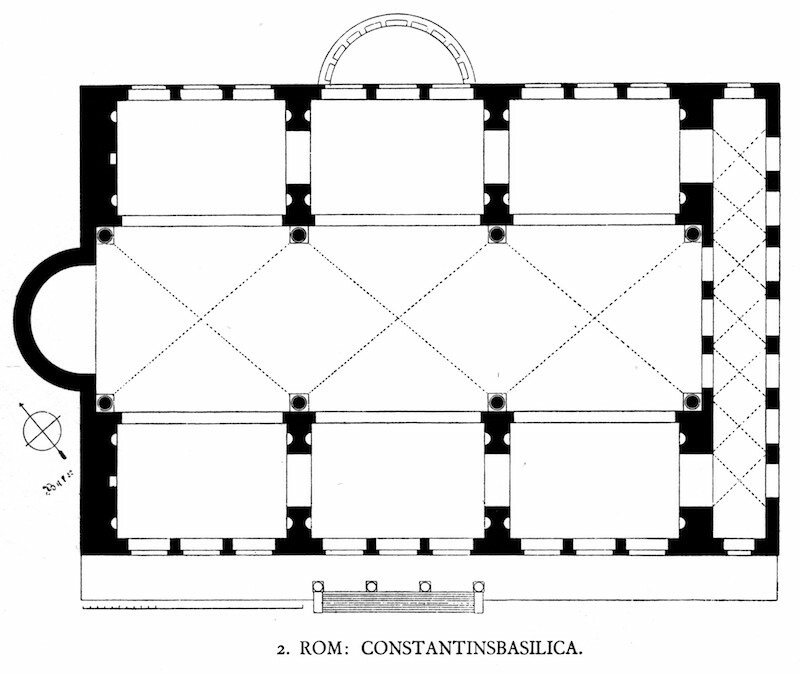 With its major central nave and two lateral aisles, the Basilica of Maxentius and Constantine inspired future Christian basilicas and many architects during the Renaissance. Among them, it is said that Michelangelo draw inspiration from it for St. Peter’s dome.